Three Cheers (+ Nursery Designs) for the Wooster Crib! What’s a Wooster you say? It’s our new crib! The Wooster crib combines high-design style with safety, the best combination of form and function. We’ve got to say, we are so excited to bring our community a crib that can be loved and appreciated by all of your precious babies. To celebrate our launch, we have put together three inspirational nursery looks and want to know which is your favorite! Oh, and one more thing—the Wooster is available for a sweet price all this month, scroll to the bottom of this post for more deets. Rainbow raindrops keep falling on my head! Like sprinkles for a nursery, this colorful and whimsical nursery theme says pretty and cute without getting too dolled up. The modern rocker and graphic wall art prints keep the look down to earth while the show-stopping animal heads against the dotted wallpaper are all about dreamy fun. Give me all the stripes! 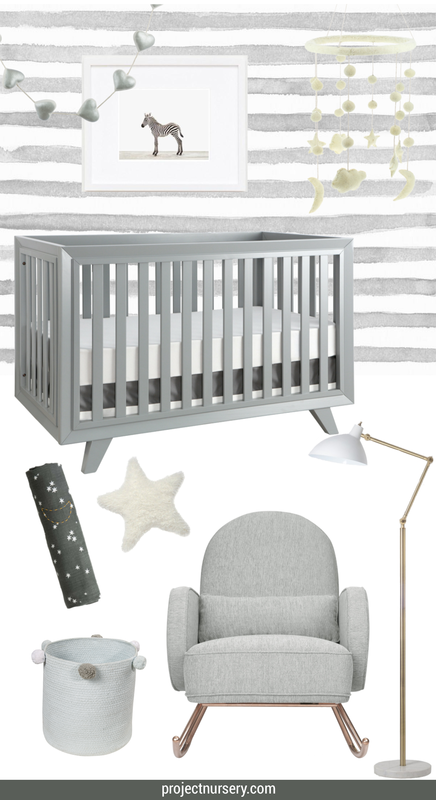 The sleek vertical lines on the gray Wooster crib inspired this graceful gray nursery theme that features multiple interpretations of grays and stripes. If you can stop swooning over this watercolor striped wallpaper for a moment (I can’t), then you’ll notice additional mid-century touches like the floor lamp and rocker that give a nod to the Wooster crib. Plus, we’ve thrown in some galaxy accessories to encourage sweet dreams for all. Wood tones are showing back up in interior design everywhere. If you’re more into the earthy look, take a page from this boho nursery inspiration and start with the Wooster crib in almond. The warm tone pairs perfectly with layers of texture and nods to nature. The Project Nursery Wooster Crib is now available in white, gray and almond for the limited time price of $299. I am serious when I say LIMITED TIME, so scoop up your favorite color soon by shopping in The Project Nursery Shop. P.S. We’re curious to know which of these three styles you are most into. Leave us a comment with your thoughts!